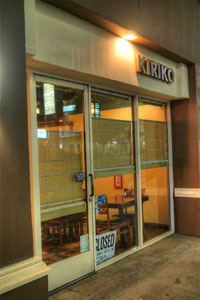 Certainly, one of LA's sushi staples over the past decade or so has been Kiriko, Ken Namba's tiny but much-lauded Sawtelle eatery located inside the Olympic Collection events venue (for you Shahs of Sunset fans, this is where Mike's younger brother Jonathan Shouhed held his dental school graduation party). 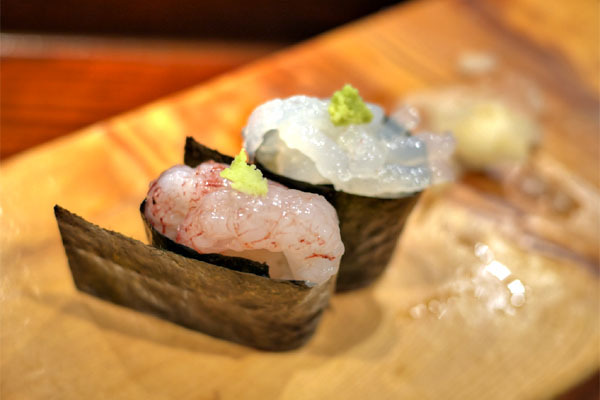 Named after the Japanese art of colored, cut glass, the restaurant opened in 1999, and is known for its traditional sushi preparations in addition to its more modern, internationally-inflected dishes. About the Chef: Namba-san was born and raised in the Tsukiji district of Tokyo, and grew up in the midst of the famed Tsukiji fish market. His family ran restaurants in the area, and he began working in them at an early age. 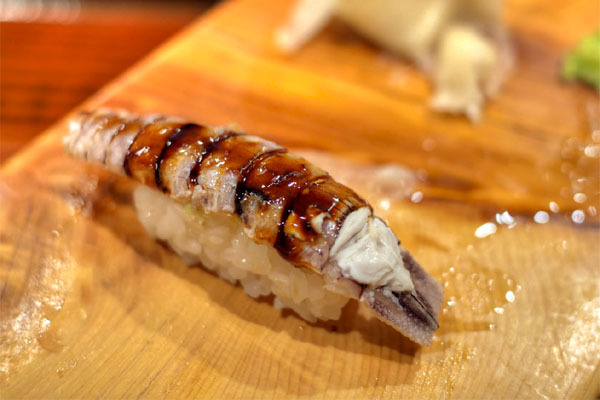 In 1974, he moved to Urayasu in Chiba Prefecture and started his sushi apprenticeship, but soon found himself in Los Angeles, helping to open Teru Sushi in Studio City, which debuted in 1979. 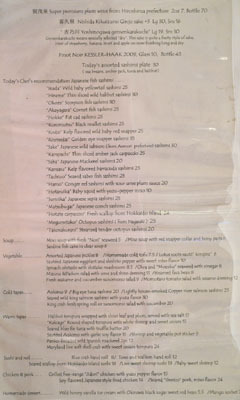 Teru, from what I understand, was one of the first places in LA that really kicked off the sushi craze. 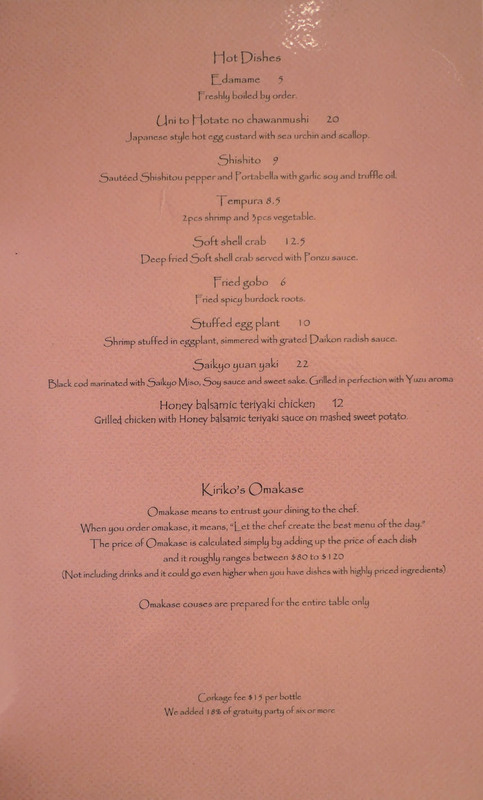 The Chef eventually opened his own restaurant in Koreatown in 1992, but sold the place after a few years. Following, he travelled extensively, working and eating in Ecuador, Bali, and Malaysia. 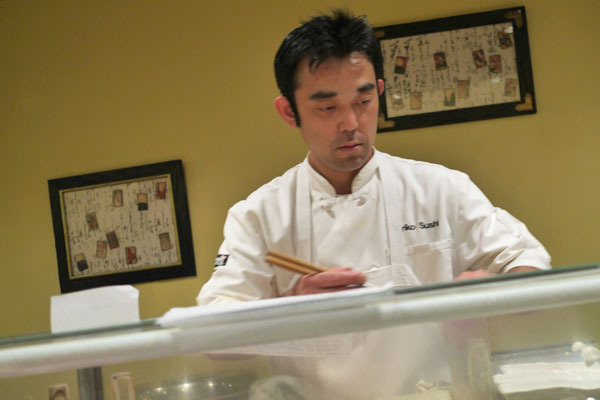 Then, in 1999, reinvigorated by his recent adventures, he returned to Southern California and launched Kiriko, which has been humming along ever since. 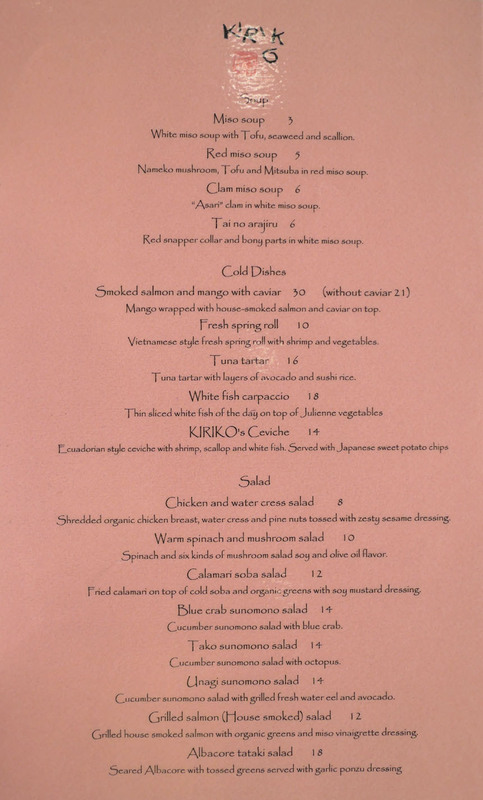 Kiriko's standard menu is comprised of both cold and hot dishes, a sushi list, as well as an array of special, seasonal items. 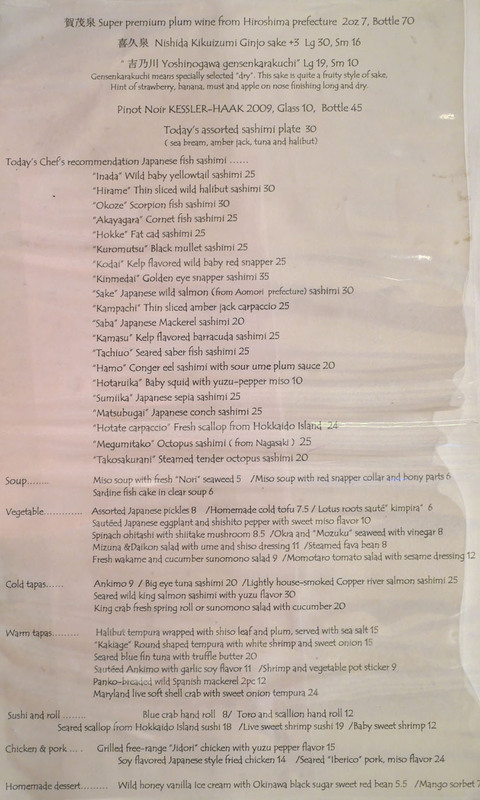 We, of course, went with the omakase, which totaled $147.33 per person this evening (determined, ostensibly, by adding up all the individual prices). Click for larger versions. As for Kiriko's beverage selection, you get a decent number of sakes, some beer, shochu, and more wines than I expected. Corkage, meanwhile, is a reasonable $15, with no bottle limit. Click for larger versions. 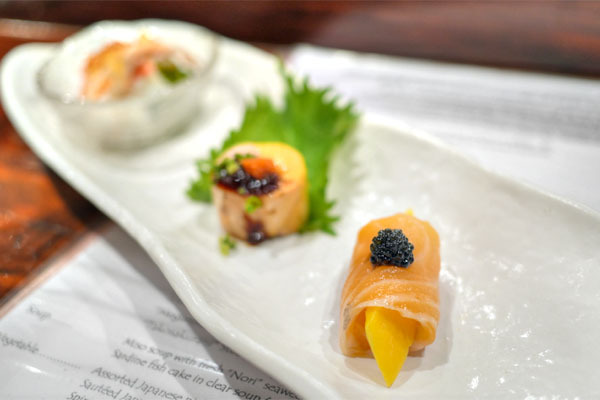 Smoked Salmon and Mango with Caviar - One of Kiriko's most well-known dishes turned out way better than I'd expected. You got the saltiness from the caviar initially, which then led to the lush, smoky salmon, while the mango imparted a fruity sweetness toward the back end. Monkfish Liver - Ankimo was on point, a melty, rich presentation of the ingredient that was both potent, yet restrained, its ocean-y, earthy taste tempered by the liver's tangy accoutrements. 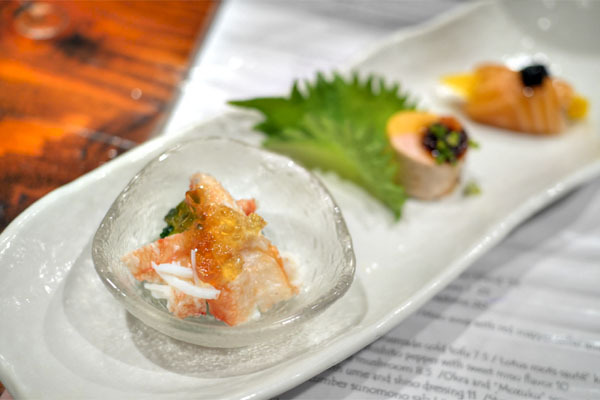 King Crab Salad - A sunomono salad of sorts, the sweet, cool brine of the crab here was played against an overarching piquancy that helped even out the dish, all while the use of cucumber gave up a counterbalancing crunch to things. 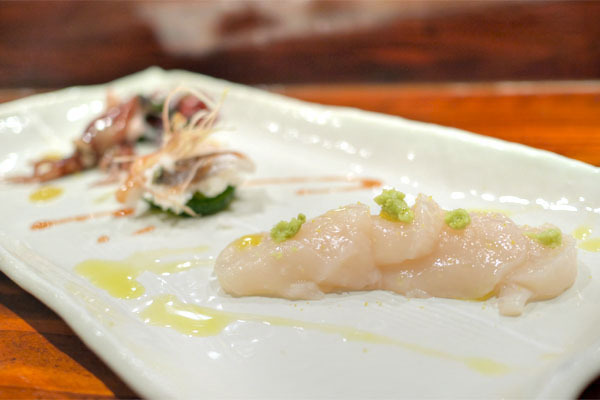 Hokkaido Scallop - Scallops were delightful, their sweet salinity perked up by hits of sea salt, the wasabi lending a lingering heat toward the finish. Nice. 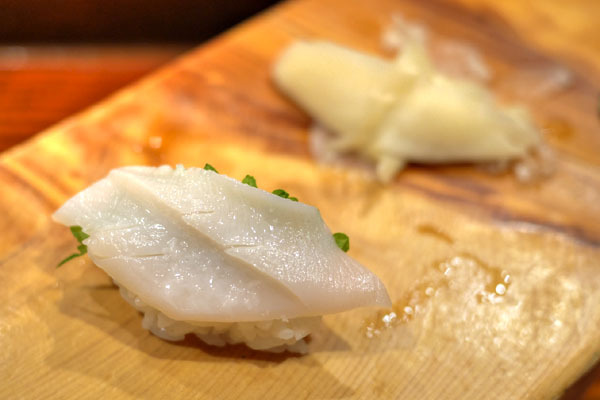 Conger Eel - Hamo is a quintessential summertime ingredient, and here it came with its traditional accompaniment of sour ume plum sauce, which provided a tangy counter to the mild, supple fish. I liked the use of cucumber here as well, its crunch adding some textural variation to the bite. 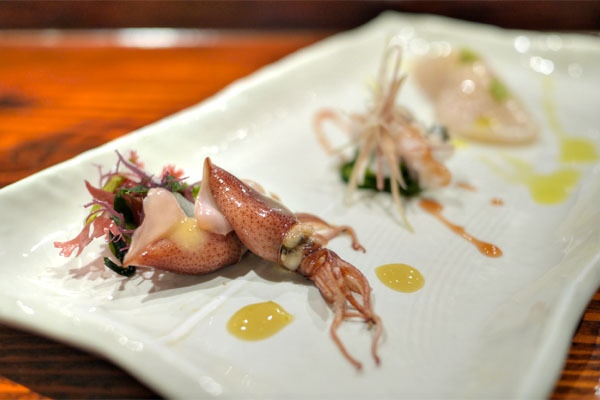 Baby Squid - Hotaruika was presented with a yuzu-pepper miso sauce, the earthy depth of the condiment forming a foil to the briny taste of the firefly squid. I also appreciated the moderating effect of the seaweed here, too. 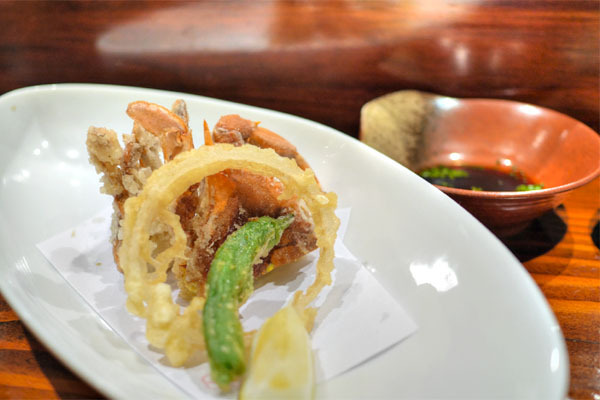 I'm not a huge fan of soft shell crab, but Kiriko's was undoubtedly one of the best I've had. 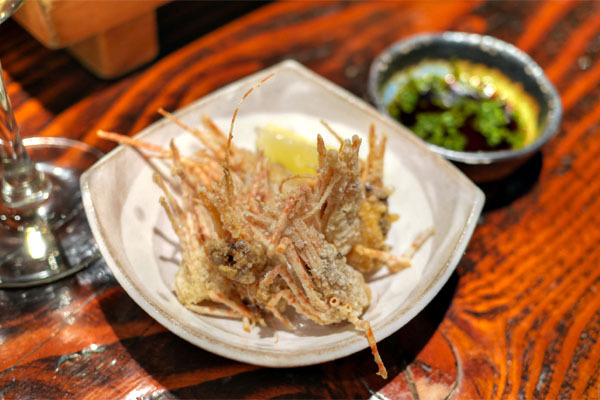 Done in a tempura style, the crab showed off a fantastic savor and salinity, along with a texture that balanced the crisp shell with the creamy innards. The included ponzu was a smart pairing as well, and the sweet onion and shishitos were spot on, too. We commenced with bluefin, a classic presentation with the fish's silky texture and soy-enhanced flavors a fitting match with the rice. 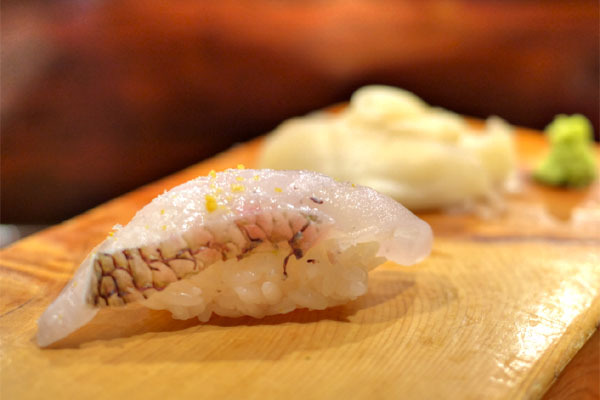 Red snapper was tarted up by the inclusion of sea salt and yuzu, the duo conveying a great citrusy character and pricks of salinity that worked swimmingly with the clean flavors of the fish. 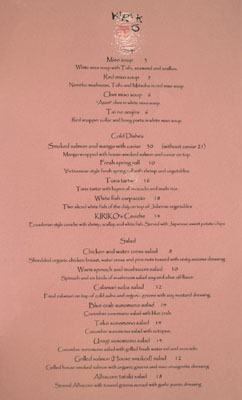 Seared golden eye snapper was a favorite, its fantastic char savor perfect alongside the zing of yuzukosho. Very gratifying. 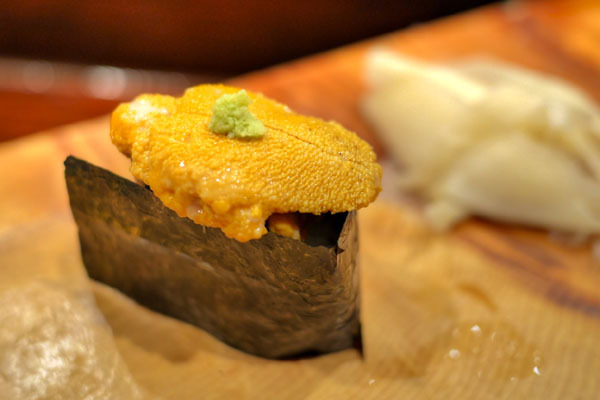 Sea urchin hailed from San Diego, and was a particularly lush example, its creamy heft finished with a subdued brininess toward the end, the nori adding a well-placed hit of umami. 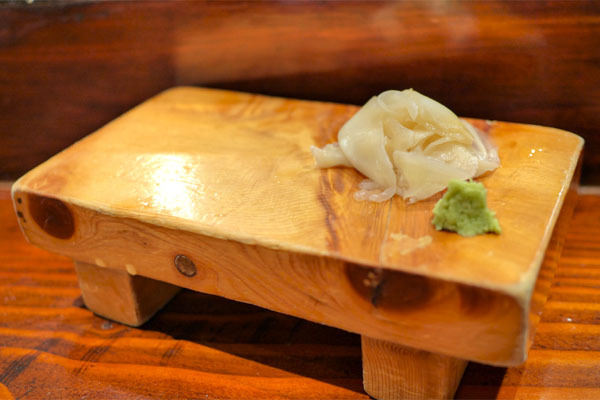 Geoduck came out super crunchy and tasting of the ocean, its intensity evened out by a sliver of minty shiso and a sprinkle of sea salt. Next were two types of shrimp, presented side-by-side. In the front was shima ebi (striped shrimp), which I found very sweet and delightfully snappy, with a great base of umami flavor from the seaweed. 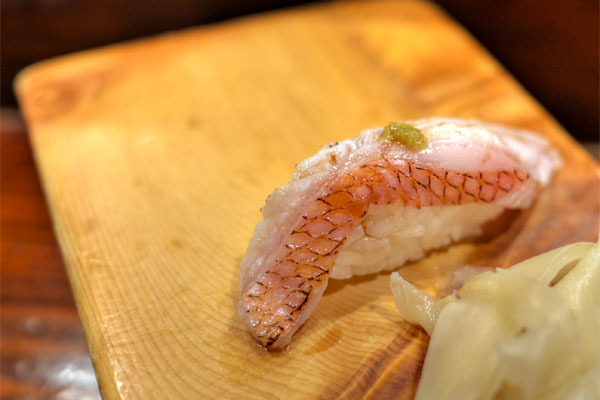 The Toyama Bay shiro ebi (white shrimp), by comparison, was noticeably milder in flavor, with softer textures and a key counterpoint in the form of wasabi. Shrimp heads, of course, were as savory and crunchy and delicious as you'd expect. 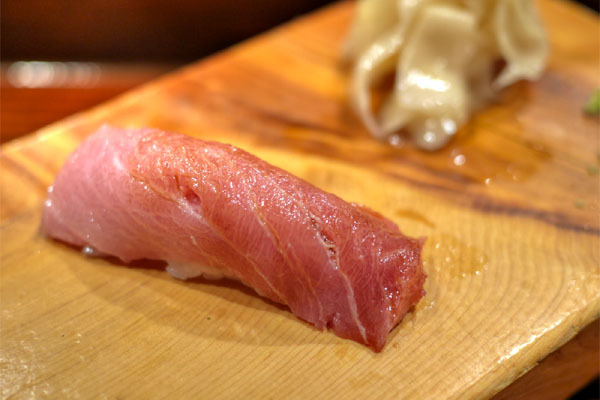 Bluefin toro was rather enjoyable too, a rich, fatty, fully-flavored, melt-in-your mouth celebration of tuna. 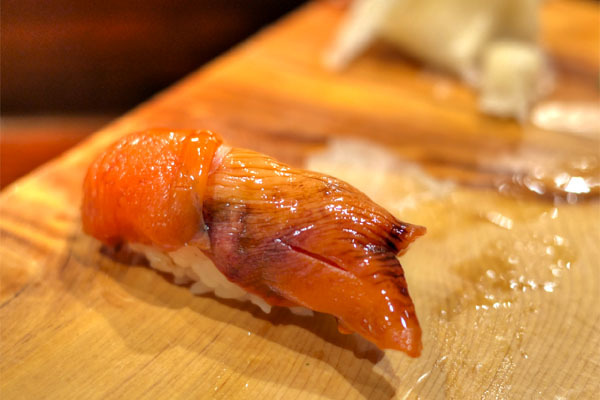 Mantis shrimp was a rare treat, something that I'd had only once before at Kyubey in Tokyo. 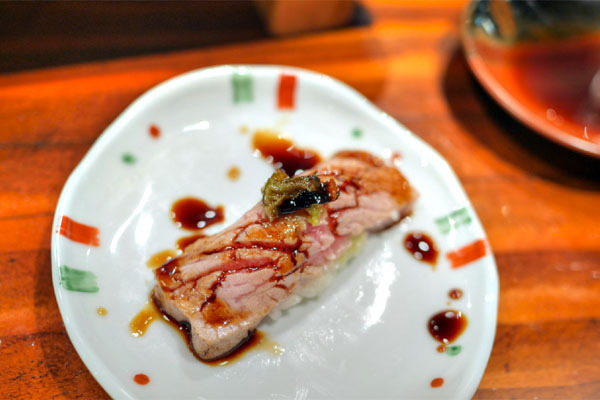 Think meaty in texture, with a distinct sea-like taste to it set off by the tangy sauce on top. Red clam, also known as ark shell, was also something that I don't see too often. That's too bad though, as I quite enjoyed its spongy consistency and focused ocean-y flavors, joined by a brush of soy. Sea eel was definitely one of the stronger preparations I've had, its accompaniments of sea salt and lemon really working well with the salty, hot, hearty qualities of the fish. Very nice. Seared toro was easily the most luxurious dish of the night, displaying a marvelous char that worked admirably in offsetting the considerable fattiness and oil in the fish. 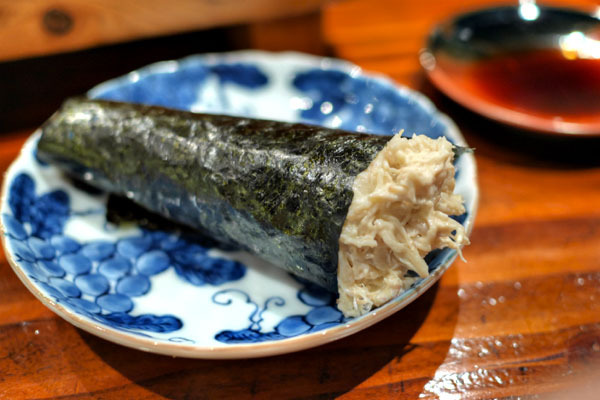 The ubiquitous blue crab hand roll was done justice here, managing to become one of the best versions I've tried. The crab itself I found particularly sweet and creamy, but the crux here was the use of cucumber, which imparted a fantastic crunch and lightness. 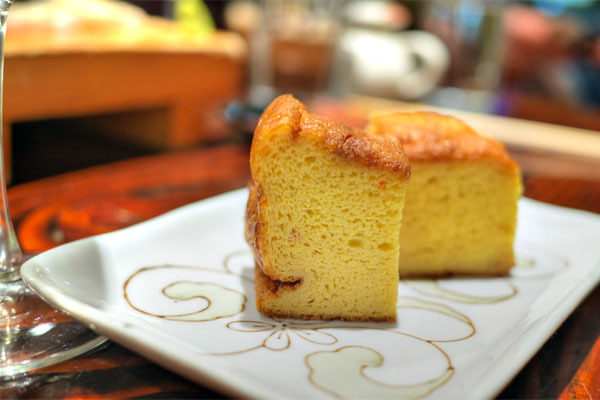 We ended our savories with a castella-style tamago, a spongy, moist preparation of the staple that was simultaneously eggy yet reminiscent of the ocean. 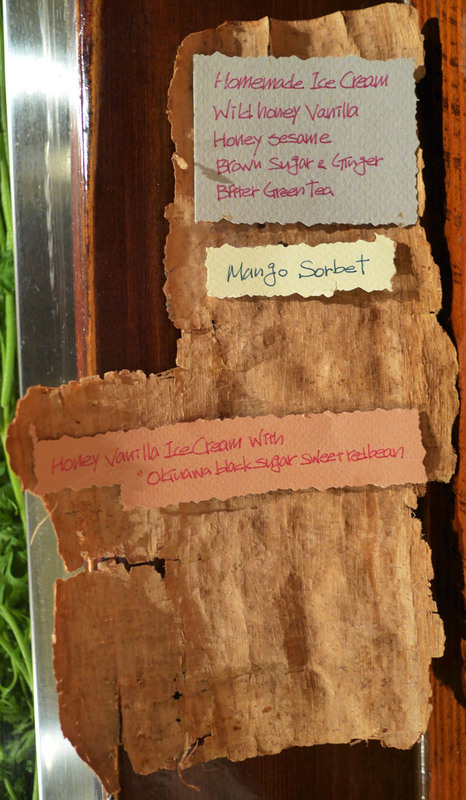 Kiriko's dessert menu features the restaurant's homemade ice creams, and was easily the "craftiest" I've seen, coming attached to tree bark. Click for a larger version. 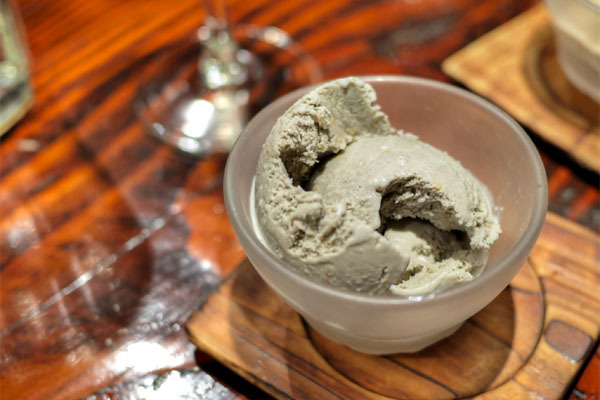 The requisite black sesame ice cream was superb, one of the best I've had with its robust nutty-sweet sesame flavors. 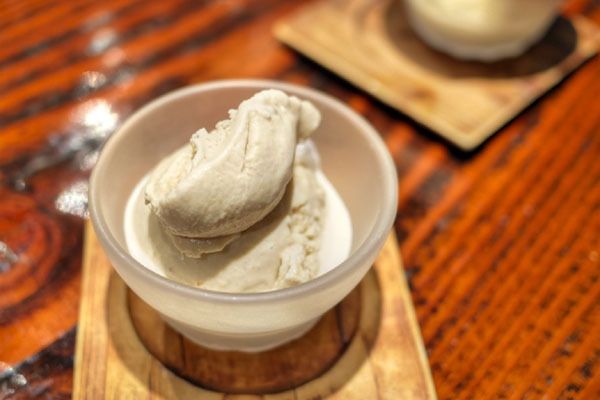 This next ice cream was a winner as well, its bold ginger essence smartly balanced by the sweetness of brown sugar. Loved the tiny shards of ginger here, too. 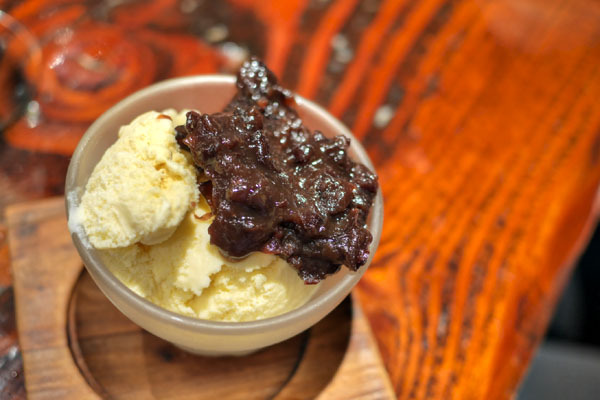 Honey vanilla didn't disappoint either, its honeyed character melding flawlessly with the classic taste of vanilla, all while the red beans imparted further sugary interest to the dessert. Yum. Our itamae for the evening, Shinji-san. It's taken me way too long to get to Kiriko. 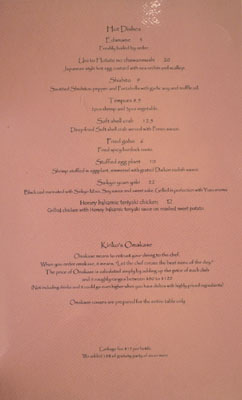 I certainly had my expectations about the restaurant, and I'm happy to report that the kitchen managed to exceed them. The food was pretty much spot on from the get go, and showed off a nice bit of variety as well. 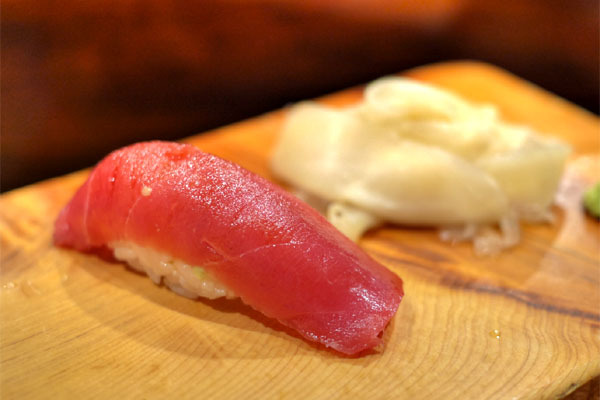 I can certainly see why this place is so often mentioned in discussions of LA's sushi elite. Definitely give it a shot; just try not to wait as long as I did. Hey Kevin, do you ask the restaurant for a biographical sketch of the chef or do you independently research it? In almost all cases, it's independent research. I've asked chefs before to clarify certain details, but that's fairly rare. Josh: I'd say just a touch below. 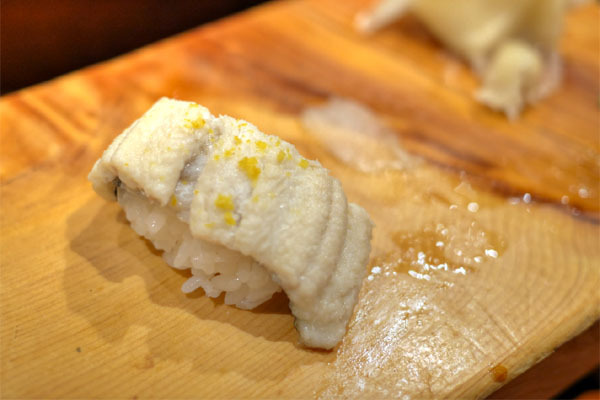 Another place you'll want to consider is the new Sushi Tsujita.